In 2005, when the project began, the old incandescent lighting system was 27 years old and plagued by myriad issues. The environment on the river was rough on the bulbs—all that wind and water—and the city only replaced burned out bulbs twice a year. That meant tough luck for any that died even 24 hours after the bi-yearly maintenance. This led to a not-so-postcard-ready image—boathouses looking like gap-toothed jack-o’-lanterns, busted bulbs disrupting the signature silhouette. Annual maintenance costs, for new lights and labor, were around $50,000 a year. So the city eventually made the big decision to switch out the system completely—replacing the old six-watt incandescents with LED lamps. Still a relatively new technology at the time, the LEDs burn only a quarter of a watt, or use 96 percent less energy, and have a lifespan of twenty to twenty-five years. The process was complicated, and there were a lot of people to please. The boathouses had concerns (Fairmount Park owns the lights, but needed approval from the houses’ owners) and the Historic Commission had to sign off. Maintaining the signature points-of-light appearance wasn’t easy. At the time, there was only one company (Color Kinetics) that made LED lamps that would work, and even those weren’t perfect—the new lamps were smaller than the original incandescents and had to be placed closer together to maintain the familiar feel. More lights usually mean more energy, but the upside of the LEDs was so great that energy costs were still cut by 88 percent. One of the upshots of the LEDs is their ability to emit light in a variety of colors. Fairmount Park brought in a lighting designer, Troy Martin-O’Shia, and he went to work on some seasonal and celebratory lighting schemes. This wasn’t easy—each light has its own distinct IP address and had to be entered into the system individually. Every light is now controlled through a central panel on the riverfront. 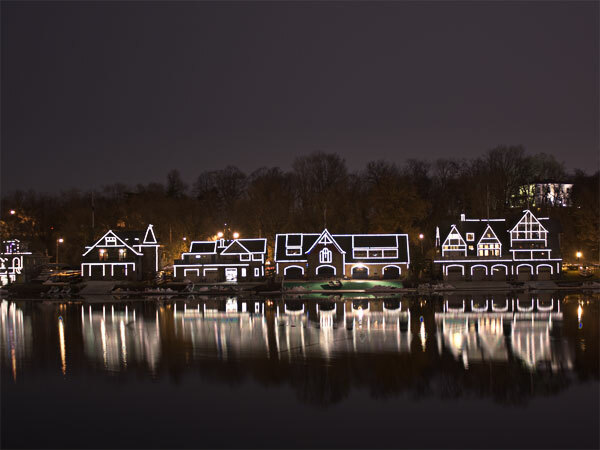 This holiday season, when you travel down I-76, maybe you’ll take an extra look at the lights of Boathouse Row. You should see green, red and gold lights alternating close to the water, with white lights along the rooflines, simulating freshly fallen snow.